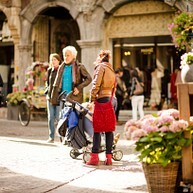 Trendy boutiques, colourful shops to browse in and authentic specialist shops in Leuven are all just a stroll away. Pedestrian plazas and attractive short-cuts lead shoppers through streets with coffee bars, pubs, pavement cafés and enticing restaurants. No matter in which direction you leave the Grote Markt, within a minute you are sure to discover a gem of a shop. The shops are open from 1 pm to 6 pm on every first Sunday of the month. Renovated shopping area with a supply of goods and services geared more towards a regional clientele and people working in Leuven. 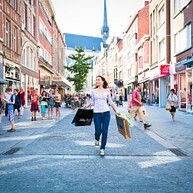 The "Champs Elysées" of Leuven is exactly one kilometre long, straight and grand, but a very stylish and lively shopping street with retail chains, colourful cafés and boutiques. Besides the obligatory department stores, you will also find exclusive shops selling clothes and decoration items. 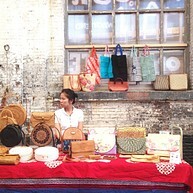 The "place-to-shop" for those who love things that are "different" and "trendy". 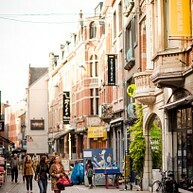 This shopping street, which also has a range of culinary shops, offers a somewhat southern flavour and is a must for those who visit Leuven for shopping. More intimate and cosier than Bondgenotenlaan or Diestsestraat, this narrow street invites you to stroll through it slowly. This is a typical student street; during the academic year, it buzzes with young students. 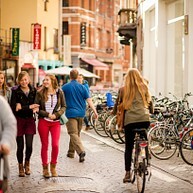 The street offers student housing, restaurants, cafés and shops. Cafés, restaurants and shops with a cultural flavour nestle comfortably side by side with old university buildings. 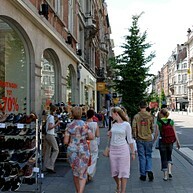 The Parijsstraat is also well-known as a street of trinket shops. You'll find shops selling hand-made and blown-glass gifts, comic book stores, music and clothing boutiques, and other speciality stores. Pleasant wide shopping street with a mix of chains and exclusive shops. Parijsstraat, after Muntstraat, comes a close second as a neighbourhood famous for its delicacies. Here, the emphasis is on world cuisine.